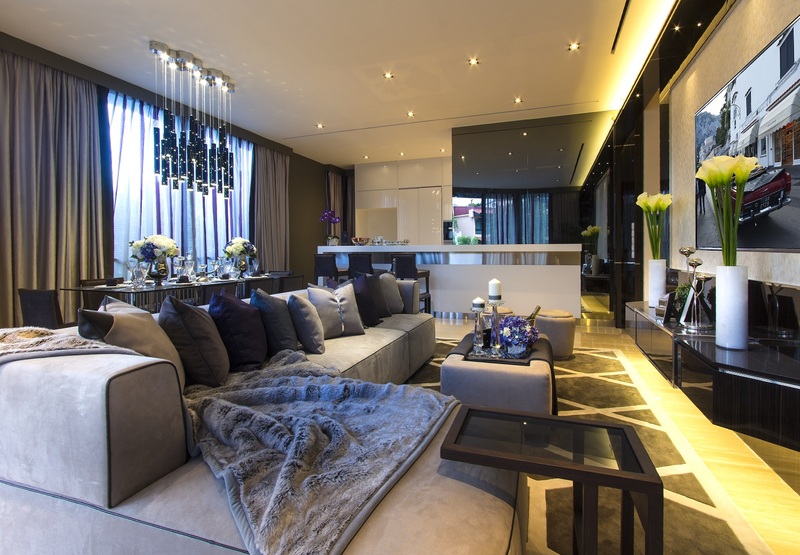 With its outstanding portfolio consisting of launched houses, showflats and private residences, these masters of luxurious bespoke interiors have steadily established SuMisura’s presence as a leading interior design firm in Singapore. They have once again infused their trademark sense of style, grace and impeccable aesthetics into this massive project which was, once upon a time, in dire need of a keen eye and special touch. Fernhill Crescent, a semi-detached house with a built-up area of 5,802 square feet, can be found nestled within the exclusive good class bungalows enclave in the prime District 10. Its owners, a family of four, were longing for a timeless, contemporary abode that complimented their residence’s colossal structure, which includes five large ensuite bedrooms, a private swimming pool and a built-in elevator. SuMisura delivered a stunning interior design scheme that is in line with the home’s architectural façade in just four months. With a focus on crafting a pristine look that embodies characteristics of the owners’ preferences and is filled with expressive, powerful overtones, the designers drew inspiration from Italian brands in which tradition is constantly being reinterpreted in an innovative way. An assortment of lighting techniques are utilized and highlight flavors of elegance, filling different sections of the house with multiple layers of soft and firm illumination. Materials selected have been polished and refined, with objects carefully adorned with subtle details including polished steel and high gloss ebony to further emphasize the theme’s solid foundation and style. The overall structure and shape of the land played a large role, which in turn, inspired SuMisura to create and invent bespoke furniture pieces that integrated effectively with the contours of the different rooms as well as help broaden the circulation of the space. Sleek, tailored details on the bespoke furniture pieces as well as the wall paneling emphasize an underlying vibe of elegance and unbridled luxury. 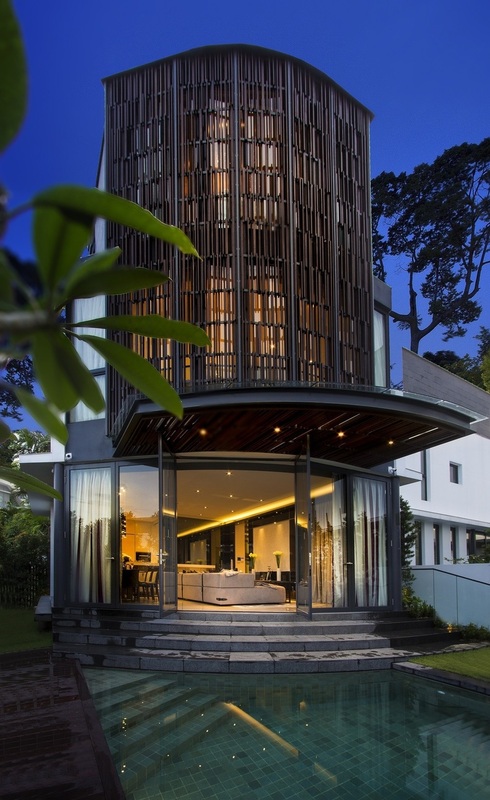 A crystalline palace unfolds around you as you enter this modern marvel. 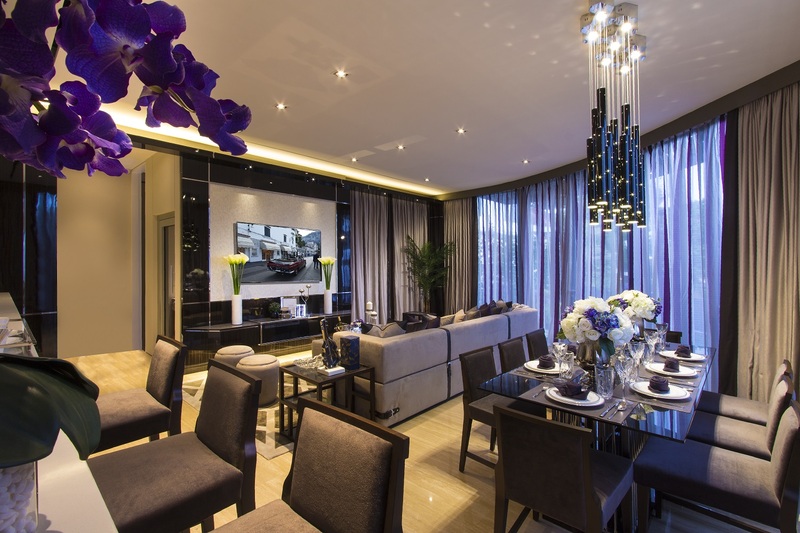 One of the most prominent features of the home can be found in the spacious Living and Dining area. An entrance fitted with a full height wall-to-wall gantry, that seamlessly doubles up as a TV console embedded into the layout, leads you into this wonderland, creating the illusion of a grander feature which incorporates the architect’s existing window framework. Inside the Living area, bespoke furniture pieces like the sofa and stools are tailored in sleek fabric with leather belts and pleats, further eliciting a contemporary vibe. 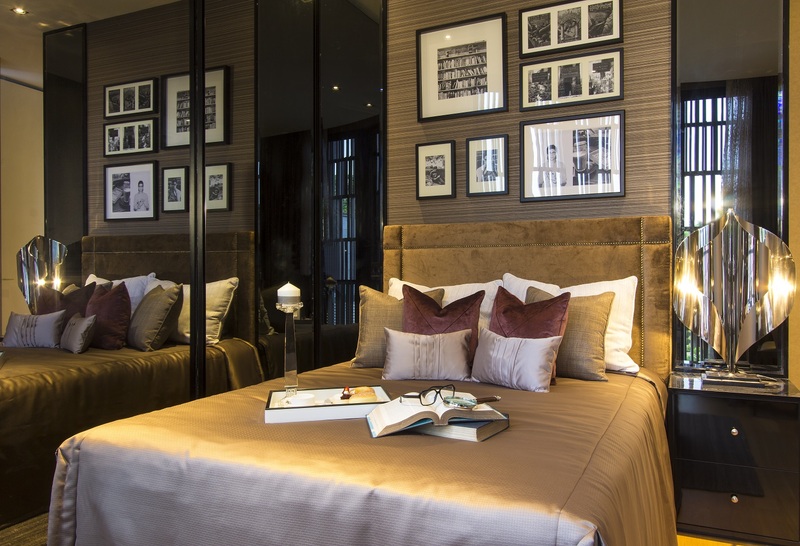 Bespoke wall paneling, as well as an open framework featuring mirrors and high gloss ebony, brings this part of the home together. Furnishings were specifically chosen and flow towards the singular purpose of balancing vigor with comfort through components such as headboard features and premium leather and velvet on the sofa. As smooth, soft-toned wooden flooring runs through different parts of the space, intermingling with color schemes that take center stage, a large gray rug (complete with white pendant-shaped patterns) accompanies the sofa and makes for an enticing, lounge-like feel. The sparse, yet effective inclusion of plant elements that can be found at both ends of the gantry as well as on the dining table bring added doses of breathability into the mix. In a space that glitters such as this, a vital part of the execution is in the lighting. Meticulously crafted, a luminous pendant light dazzles, hanging above the dining table and at night, the light mirrors the assemblage of stars. The layout does intrinsically allow for a harmonious balance between natural lighting and well-placed in-house lighting. Lights range from standalone specks that are built high into the ceiling, to soft glowing fixtures that run along the top of the TV area. Slightly warmer than the previous part of the house, the master bedroom can be found on the second story and brings the cozy vibe up a notch. Its layout presented the characteristics of a wedge-shaped corner plot, which meant that more attention was required when planning the space. In order to achieve the functional yet aesthetically pleasing look that had been decided upon, careful implementation of unconventional forms has been incorporated. The dressing table, placed near the window, is shaped in an asymmetrical teardrop to help enable fluid integration with the layout of the room while the bed headrest is decked out in beautiful leatherette, in a design that mimics the exterior facade. Easily one of the most personal parts of any home, elements that represent the traits of the owners’ personalities can be found here, forging a stronger connection between the space and those that inhabit it. Underlining the emphasis on sophistication and classiness, works of art and unique pieces by Ralph Lauren as well as several vintage pieces come together. The wall above the bed has been reimagined as a unique, clutter-free combination of rectangles drawn by plain black lines against pearl white. 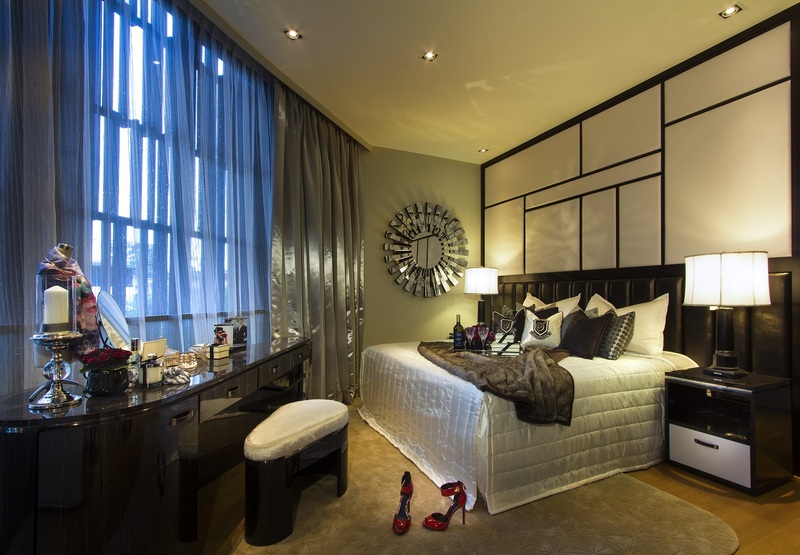 Another bedroom takes on a cohesive style as the rest of the home. Thin wooden lines complement the velvety headboard, adding texture and dimension to the interior. A classy set of picture frames arranged personifies this private area. A notch on the belt of SuMisura’s impressive track record, The Fernhill Collection stands as a concise, contemporary project that carries the design firm’s signature sense of style forward. It shows the impact that creative interior design can have on a residence, even a large one in need of a twist of something special to create an opulent and exemplary interior. 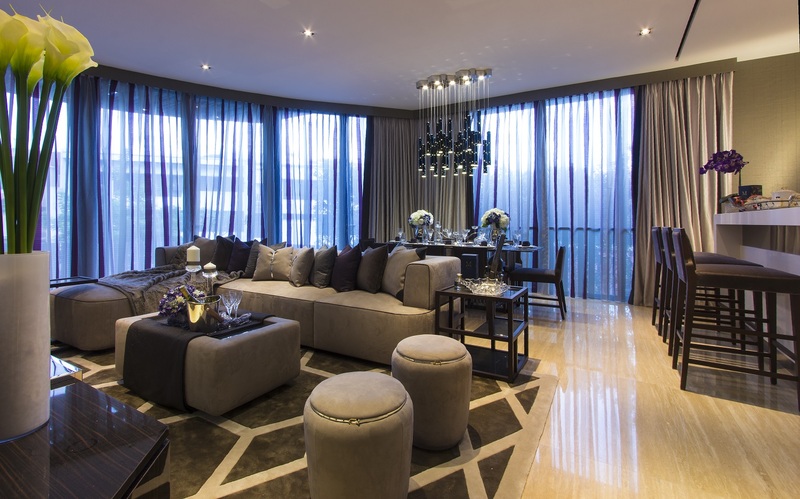 Want your home to look as luxurious as this interior? Click here for a FREE design consultation today!